If you’ve just purchased your first hearing aids, congratulations! Welcome to the world of clear hearing. Now let us tell you about everything you have to do to maintain your hearing aids. We know that’s not one of the first things you want to hear with your new devices. But if you learn proper hearing aid care now, you’ll save yourself a lot of headache in the years to come. Hearing aids come with a lot of moving parts, and diving right into hearing aid maintenance can feel like trying to fix a car when you’re not a mechanic. Don’t worry. We’ve got you covered. 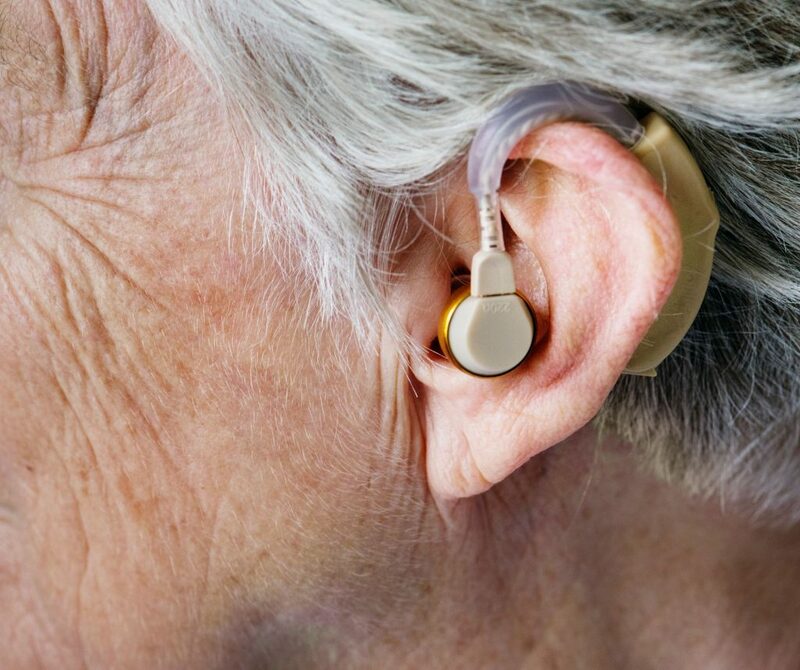 We’ve assembled this collection of hearing aid care tips to help you conquer the learning curve as quickly as possible. Read on to become an expert in caring for your personal hearing aids. Before you learn to care for your hearing aids, you should know what kind of hearing aids you have. It can seem there are as many types of hearing aids as there are ears to fit them. It’s likely you’ve already purchased yours, and your hearing professional likely recommended them based on what best fit your budget, needs, level of hearing loss, and sense of style. But in case you’re still deciding which to purchase, let’s run down the most common styles. These hearing aids are for individuals with mild to moderate hearing loss. The reason they get the “invisible” part of their name is that they are custom fit to go farther into the ear than other styles of hearing aids. Thus, they can appear genuinely invisible, depending on the structure of your ear. To promote good ear health, you should remove IIC hearing aids daily. These hearing aids go deep as well. They fit all the way into the ear canal, and the only thing that keeps them from being invisible is a small plastic handle that shows outside the canal. CIC hearing aids are also appropriate for people with mild to moderate hearing loss. ITC hearing aids fit a greater range of patients, from those with mild hearing loss to those with hearing loss just shy of severe. ITCs show a bit more than CICs, but they still fit mostly inside the ear canal. A small portion of these aids shows in the outer ear. People with mild to severe hearing loss can use ITE hearing aids. While all the previous styles of hearing aid are composed of a single module, the RIC hearing aids have two very distinct external components. They appear similar to the style below in that the largest portion of the hearing aid is worn behind the ear. But they differ in that they use electrical wires instead of a plastic tube to carry sound to a receiver in the ear canal. These wires reduce distortion in the sound. People who use RIC hearing aids usually suffer from mild to moderate hearing loss. Behind-the-ear hearing aids are the other classic type of hearing aid. They feature a clear plastic tube that directs sound into an earbud or custom earmold that fits into the ear canal. But the largest portion of the hearing aid is the casing that rests, appropriately enough, behind the ear. Those with moderate to severe hearing loss will benefit the most from BTE hearing aids. Now that you know more about the type of hearing aid you have, let’s learn about what’s under the hood. Here are the components of your hearing aid that you’ll need to maintain. We’ll use a traditional BTE hearing aid as our model, but most of these parts are common among the other types as well. We list these parts together because they are connected. The microphone is the piece that picks up the sounds in your surroundings, and the amplifier broadcasts those sounds into your ear. Both of these components are housed in the casing on the outside of your ear. This is the part of the hearing aid that is most like the frames of eyeglasses. It gets its name from the fact that it hooks over your ear. Even though the ear hook is made of plastic, it is not the same thing as the next part below. This other plastic piece is a transmitter of sorts. It takes the amplified sound from the casing behind your ear and brings it to the piece of the hearing aid you place in your ear canal. That piece in your ear canal is called the earmold. When we talked about custom-fit hearing aids in the section on the different styles, these are the pieces that are most often custom-fit to patients’ ears. Earmolds are made of plastic or acrylic, and they are supposed to conform to your ear canal and concha bowl, which is the part of your outer ear right next to your ear canal. There are many different types of earmolds. Some words you may hear thrown around include canal earmolds, full-shell, and half-shell earmolds, and skeleton as well as semi-skeleton earmolds. We’ll forego an in-depth exploration of the differences between the different types of earmolds. Suffice it to say, they are all unique shapes that accommodate different types of hearing loss. Yes, we’re going to include this as a feature of your hearing aids. The reason is this switch is responsible for many supposed “malfunctions” hearing aid users experience. Getting to know where this switch is on your hearing aid’s casing can help you do the easiest troubleshooting when a problem arises without having to contact your hearing professional. It’s likely your battery compartment is located near your on/off switch. There’s not much more to say about it now, but since it is going to be important later, we want to make you aware of it. Now that you’re a certified hearing aid mechanic, let’s get you into the field. Here are the areas where you’ll want to apply your newfound hearing aid expertise. Each of these tips covers a vital aspect of hearing aid maintenance. Some of them are more hands-on, and others are more abstract. But practice all of them, and you’ll minimize your struggles with these amazing pieces of technology. Dirty hearing aids become broken hearing aids. It’s as simple as that. Most hearing aids require daily cleaning of some sort. We recommend you build your personal hearing aid cleaning routine into your day as you do brushing your teeth and the rest of your daily hygiene. Clean and dry is the name of the game here. We’ll delve more into water damage a little further down the list. For now, remember to wipe your hearing aids with a dry, soft cloth before storing them for the evening. This wipe will help clear your microphone’s screen of debris and keep it functioning smoothly. Also apply this wipe down to your ear hooks, which can break down over time due to their exposure to body oils and sweat. Some of this is unavoidable, but you can slow this erosion down. The tubing on your hearing aid is also prone to break down over time, so inspect them each day for signs of cracking. Also make sure they are fastened well on both ends, to your ear hook as well as your earmold. The lifespan of a hearing aid battery can vary wildly. Some can last a full two weeks, while others only make it a few days. To keep your batteries functioning at its peak capacity, first make sure you have inserted them properly into your hearing aids. This is on the level of checking the on/off switch to solve technical problems. It’s a basic thing many people neglect because of its simplicity. Speaking of that on/off switch, you should preserve the life of your batteries by removing your batteries each night. Not only will this save power, but if you leave your battery compartments open, that can prevent moisture from ruining those compartments from the inside overnight. Here we meet the natural archenemy of the hearing aid: ear wax. Everyone experiences it, which is why it’s so important to take measures not to let it ruin your hearing aids. Because of its physical properties, ear wax can invade your hearing aids. When wax enters the various crevices of your hearing aids, it can cause serious damage to the mechanical components inside. The best way to prevent ear wax from ruining your hearing aids is to include a check for wax in your cleaning regimen. A clean, dry cloth is the best defense against wax, and you should by no means use tissues or other paper products. These products often have traces of lotion or aloe, and those things can be just as bad for your hearing aids as ear wax. Plus, you run the risk of getting tiny traces of paper stuck in or to your hearing aids, so it’s best to avoid even paper products without lotion or aloe. When wiping your hearing aids, don’t wipe debris into microphone ports, and if your hearing aids came with a cleaning tool for the tubing, use that tool regularly to prevent wax buildup. Accidents happen to everyone, but there are a few especially common ones for hearing aid users that you can take measures to prevent. The first is exposure to water. This includes perspiration, especially humid weather, and condensation of any kind. Many hearing aids are water-resistant, but that does not mean they are waterproof. In addition to taking the measures we’ve talked about already, like leaving your battery compartment open to avoid condensation, the majority of water damage prevention involves using common sense. If you are a swimmer, make a plan for storing your hearing aids in advance and stick to it. If you are not a regular swimmer but plan on taking a dip, be especially careful not to forget to remove your hearing aids before entering the water. When it comes to showering or bathing, keep your hearing aids in their case. And even better, leave that case entirely out of the bathroom. The other big risk comes from hearing aids suffering physical damage due to dropping. Again, the preventative measures to take are common sense ones. When you do have to take your hearing aids off, make sure you leave them in areas away from children and animals who can carelessly knock them onto the ground and break them. If your hearing aids do suffer physical damage, do not wear them. Instead, follow our next tip! You should schedule regular appointments with your hearing professional every four to six months. These appointments involve professional cleanings and allow you to ask any questions you have regarding your devices. You can also get adjustments made. This is a subtle one it might be easy to overlook. Hair products can ruin hearing aids the same way ear wax can, and because of the number of chemicals in them, they often work much faster than ear wax in their path of destruction. Don’t use hairspray, and especially don’t spray it, when wearing hearing aids. If you must have hair care products, see tip #5. This final tip sums up a few of the previous ones, and if you follow it well, you won’t have to worry about things like water damage, dirt, or physical accidents. Get a sturdy storage case for your hearing aids. Keep that case in a place that is safe from bumping and that is away from water. Do not allow pets or small children near your storage spot. Do these things, and your ears will thank you. There’s a lot of minutiae to attend to when it comes to hearing aid care. But these little devices are your companions now. If you treat them well, they’ll give you peace of mind, knowing you won’t have to worry about anything other than natural wear and tear. If you’re still on the fence about which hearing aids to buy, check out our guides to the best and worst ones on the market and the factors to consider when making your purchase.